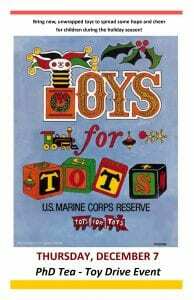 The PhD Program is hosting a Toys for Tots TEA on December 7, for the 2017 Toys for Tots drive to help spread hope and cheer for children during the holiday season! Last year, the school’s fantastic effort managed to fill 6 boxes! We hope to see continued support for the program and it’s recipients.